The team was The Cleveland St Patricks Gaelic Football Club, which had an impressive record in the Mid west competition for many years. This photo was probably taken in 1958. Joe Boyle, who was a member of the team, supplied these names. Back row left to right, Unknown, unknown, Owen Lowry, Jack McGill, Joe Lowry, Fr. Pat McAteer, Eamon Darcy, Ray Hollywood, Pat Dowling, Paddy Millar, Don Green, Paddy Duffy. 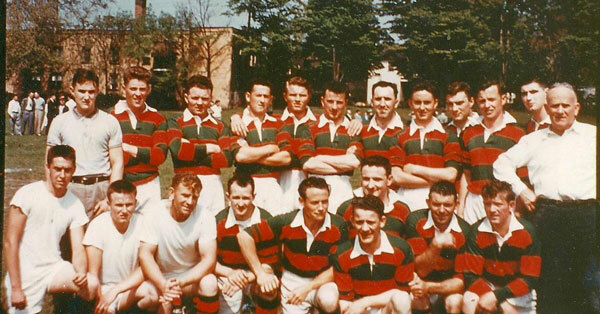 Front Row, L to Right, Sean ONeill, Eddie Coyne, Tommy Moylet, Paddy Mannion, Dennis Harringtom, Joe Boyle, Mickey Prendergast, Pat Savage In front Des Kennedy. Are there still some blanks that need to be filled in? Let us know if you can add more names to any of our Mystery Photos or if any spellings need to be corrected. E-Mail us at Info@IrishArchives.org.